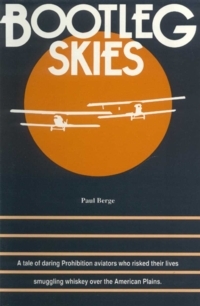 Over 37 years in the making (that's how long it took the author to learn this stuff), the Private Pilot Beginner's Manual (for Sport Pilots, too) by Paul Berge is finally out! Written in an easy-to-read, amusing style, this 320-page illustrated book takes the beginning aviator from "This is an airplane" through all the subjects required to become a Private Pilot or a Sport Pilot, including aerodynamics, airplane controls, airports, airspace, aviation weather, Federal Aviation Regulations, air traffic control, Weight & Balance (a normally deadly dull subject brought to life here), cross-country planning, aircraft performance and navigation. 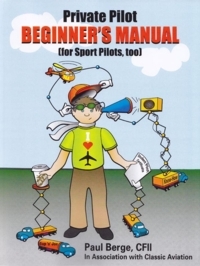 This book is ideal for the beginner (hence the name) and for instructors looking for a student manual that won't scare off future pilots with overly technical dissertations. Instructor, ground school and FBO queries welcome. It’s 1937. The Depression lingers as Dust Bowl and SPAM enter the American lexicon. War begins in Spain. Amelia Earhart is lost over the Pacific, and the King of England, unable to cope with her loss, abandons the throne to marry some woman he pretends to love. More importantly, Prohibition is over, leaving thousands unemployed. Gangsters, G-men and barnstormers who’d once made a respectable living in the bootlegging trade turn now to less interesting work. For pilots this means airline jobs, except for one enterprising flyer, Kate Strauss, who can’t qualify for the airlines, because No Women Allowed in the cockpit. Kate, along with a devoted circle of friends and lovers, keeps a small midwestern flight operation aloft by the numbers…the numbers racket, that is. 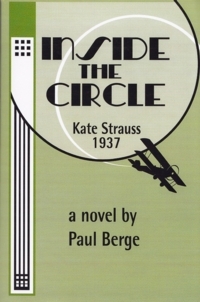 Money laundering, Chicago mobsters, biplanes, newsreel footage, running boards on a blood red Ford V8, ten cent gas and nickel cigars, plus a few Hollywood celebrities just to give it class…it’s all Inside The Circle. (Rated PG-13 for gangland violence, crude language and shameless smoking in public.) Sold through Amazon.com, Lulu.com and eBay. Order "Inside The Circle "
"Above The Ordinary" is a short video starring a P-51 Mustang and...well, we don't want to give too much away, so just click, watch, enjoy and share. And if you want to participate in the "Above The Ordinary" campaign, click the link at the end of the video. Seventeen years after Artie Azzetti first appeared on Rejection Slip Theater, the author finally...finally (the lazy bum) got around to publishing a paperback collection of some of the short stories about the gang of kids from St. Anthony's Elementary School in Westwood, New Jersey 07675 (Exit 168 Garden State Parkway). You'll laugh, you'll sneeze, you'll get detention in Sr. Belladonna's class. But that's no excuse. Order your copy of Artie Azzetti & Me today....no, today. Order "Artie Azzetti & Me"
Watch a free five-minute video about Antique Airfield, home of the Antique Airplane Association. 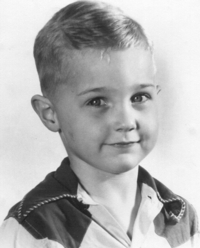 Produced by Joe Pundzak, Living The Legend-Blakesburg was written by Joe Pundzak and Paul Berge. So, pull down your goggles and...enjoy. Aviation author, Paul Berge, is a flight instructor, former FAA air traffic controller, monthly columnist for Pacific Flyer (Flights of Fancy), Pilot's Audio Update, author of AVWeb's Brainteaser quizzes (#65-present) and former editor of IFR magazine. For six years (2000-2007) Paul could be seen weekly on Iowa Public Television's Living In Iowa hosting the Emmy-nominated Side Roads travel series. Wanna read all about Rejection Slip Theater©? Okay, do you know anyone who wants to read about RST? Either way, you can jump into the rejection slip blog bog, absolutely free of guilt or financial obligation. Read the gossip, the behind-the-virtual-scene drama, and the history of radio theater's weirdest adventure. Listen to free radio theater, make faces, leave comments and forward everything to your former friends. Looking for a speaker for an upcoming event? Tired of speaking for yourself? 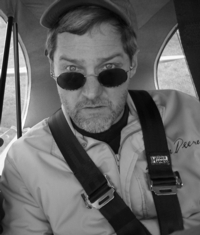 Now you can have Paul Berge, former IFR magazine's Editor (1999-2005) and author of Zen and the Art of Pumpkin Bombing©, or one of the many other aviation writers in the Transportation Speakers Association (TSA) speak for you. Speakers include: Roberta Bassin, Paul Beck, Tim Busch, Scott Dennstaedt, Rick Durden, Kevin Garrison, Jane Garvey, Gia Koontz, Doug Rozendaal, Scott Sky Smith, Brent Taylor, Jeff Van West, and Chip Wright. Read, if not all about it, at least about the highlights of Paul Berge's 4000-mile biplane trip from Iowa to California. You'll laugh, you'll cry, you'll wonder why the FAA doesn't put a stop to him. This story originally appeared in Antique Airfield Runway magazine. 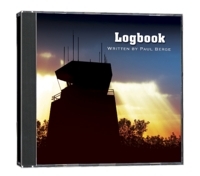 the Logbook©, an audiobook CD collection of Rejection Slip Theater (r) radio dramas written by Paul Berge and performed by the Rejection Players, is out of print. We visit Kansas City's Airline History Museum and tour the Save-A-Connie Lockheed L1049 Super G Constellation. 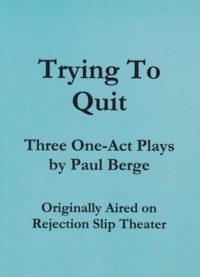 Listen to the best in podcast radio drama by Rejection Slip Theater (c)--for free. Sign up to receive (free) the original Rejection Slip Theater (c) radio dramas, comedies, westerns, sci-fi and mind-bending whatnot mind movies (c), starring such radio theater greats as: Morgan Halgren, Richard Choate, Michael Cornelison, Annie Meacham, Patty Choate, Michael Meacham, Joseph Pundzak, Linda Blakely, Greg Anderson...Oh, heck, the list goes on from here to whatever works. Invite them all into your iPod, your PC, or up on the roof where the Beatles still haven't cleaned up from their last gig. Just go to: iTunes, click on podcasts and type in "Rejection Slip Theater." Or click the link below (so easy). 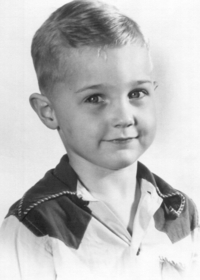 Paul Berge took his last Side Road , metaphorically speaking, at the 2007 Iowa State Fair. Six years on IPTV came to an end now that Living In Iowa has been cancelled. So, to quote Douglas Adams: "So long and thanks for all the fish." You're invited to Ailerona to search for perfect flight and live the dreams that await anyone willing to believe in a sky that's open to all. All payments through PayPal or by check. 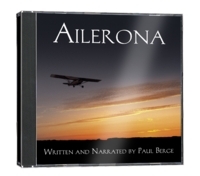 Want to read more about Ailerona's author, Paul Berge? Read his biography. Jake Hollow, bootlegger and barnstormer, hauls you and cases of illegal Canadian whisky across middle America during Prohibition. If you have a taste for a 1929 Templeton Rye and pulp fiction, you'll appreciate the smoothness of this 90-proof adventure.